Humans have a problem with falling down. More accurately, we have a problem with getting hurt when we fall. Mix Earth’s gravity with our upright walking, and there is a non-zero chance that everyone will take a spill someday. Falling is inevitable. It’s the getting injured part that doesn’t have to happen. Yet, it’s not just older adults who get hurt when falling down. Pause and think for a second. There is a good chance you know someone who broke a wrist or twisted an ankle when crashing to the ground. Maybe you’ve suffered your own fall-related battery? It’s time that we stop talking about falls mainly from a preventative point of view. Not all falls are avoidable. Instead, let’s change the discussion to how to minimize injury when the inevitable happens. Listed below are seven ways to help you avoid an injury during a fall. These are hard won insights, born from martial artists, skateboarders, and parkour athletes. These individuals routinely drop to the ground, and yet they get up again and again without injury. How they fall and interact with the ground is a curious feat, and a great starting point to the topic of injury prevention. Athletes who fall down frequently have a heightened awareness of the space around them. Why? Because if you know that a fall is inevitable, you want to drop in such a way that you avoid hitting an unforgiving surface. Slamming your head on a cinderblock is much less pleasant then landing in a soft bush. Likewise, the concrete sidewalk is a much less welcoming landing pad than the patch of grass off to your side. By scanning the environment and being aware of the world around you, you are better prepared to steer your fall away from danger. Now, you might not always have much leeway to direct your fall, but it is a good aspiration to have. Incidentally, if you are reading this on your smartphone while you’re walking down the street: Please put your device down. As with texting and driving, distracted walking makes you much more likely to careen into danger. A common theme in self-defense seminars, is that if you freeze you die. If someone is intent on causing you bodily harm and you don’t respond accordingly, well, harm happens. The same thing applies during a fall. If you have ever been to a self-defense course, recall how you practiced deflecting and responding to an attacker. You practiced your blocks and strikes over and over again to build your muscle memory. The repetition strengthened your neural pathways to make sure that you would not freeze in the face of danger. In a similar way, martial artists, skaters, and parkour athletes train themselves to recognize and respond to a fall as quickly as possible. The faster you can recognize that you are going down, the faster you can respond and avoid injury. Close your eyes for a moment. Imagine that you were ten feet above the ground, walking across the narrow metal beam of a playground swing set. Don’t bother yourself with how you got there – just play along here. You take one step, a second step, and on the third step you lose your footing. You are starting to FALL. In this moment, you have two options. Option A: you can do nothing and let the ground rush towards you, as you brace for impact. Or, option B: you scramble and claw to grab the metal beam so that you can drop in a more controlled manner. Let go and do nothing. Or, react and take control. Those are your options. Which one do you think has a better chance of avoiding injury? However improbable that scenario might seem, the same thing applies every time you fall on flat ground. Do nothing. Or, respond and take action. If you are wondering what type of response and action to take, keep reading. Athletes who fall down a lot cultivate a style of falling that helps keep them from getting hurt. Copy their style and you too can fall without injury. During a fall, your straight limbs might as well be broken limbs. Don’t believe that? Go watch a few “fail” videos. Striking the ground with outstretched limbs often leads to a broken bone. Thus, athletes who fall down a lot try to make impact with rounded limbs. They stay loose and lightly flexed across their major joints. From the spine, legs, and arms, their major body segments form into relaxed semicircles. Consider tipping a kitchen chair backward and then letting it drop back onto all four legs. That leads to a pretty rough landing, right? Now, imagine tipping a rocking chair backward and letting it rock forward. The curved support of the rocker makes for a much softer landing. As another example of what it means to avoid straight lines, place your arms out to your side, and then point your hands back toward your waist. Pretend you were demonstrating to someone the shape of your body as if you were wearing a blow-up sumo wrestler suit. Now, flex your spine a little and go loose in your legs crouching toward the ground a few inches. Once you are in this position, feel what it is like to be in this ball shape. The more ball-like with rounded surfaces you can become during a fall, the better you can avoid injury. It follows from the last point that dropping entirely onto your wrist, hip, or shoulder without spreading out your impact is a recipe for disaster. The solution is to dissipate your contact across multiple body parts. The ideal strategy is to have a light contact with the distal (far) point of your limbs, with greater absorption happening close to your larger joints and torso. Think of how an airplane comes in for a landing. The pilot doesn’t drop the plane onto the tarmac all at once. First the rear wheels touch down, then the front of the plane eases onto the ground. The analogy isn’t perfect, but that image of spreading out your contact should be helpful. Stop thinking of your hands and arms as your main shock absorbers. Instead, consider them as insect-like feelers to contact the ground and re-orient your impact. Strike lightly with your hands, then quickly transition up the chain to your forearm, shoulder, and backside. Even if your arms are out of the picture for some reason, the same sequencing applies elsewhere on your body. If you are dropping onto your bottom, spread the force across your hip, back, and shoulder. After training yourself to spread out your impact and avoid straight limb-lines, the next thing to work on is avoiding hitting the bony parts of your body. In the medical world, we call these your bony prominences and you have them wherever your bones extend close to the surface of your skin. And of course, the biggest bony prominence of all: YOUR HEAD! Training yourself to avoid impact with these bony landmarks takes some practice, but it’s worth it. After 17 years as a physical therapist, I know of numerous cases where a fall onto an elbow or knee led to a fracture. Since they are so close to the surface of your body, these prominences are not well protected and cannot take much impact. So, how do avoid hitting these tender points? Part of it comes down to spatial awareness and knowing how to tuck your body to provide them with extra protection. The other part revolves on training yourself to avoid falling along the cardinal motions – forward, backward, or sideways. Instead of dropping along these four directions you should become familiar with diagonal paths, 30 to 45-degrees off your main axis. Falling along these diagonal paths provides some protection to your bony parts, and it also uses your body’s padding more effectively. During a fall, the big muscle groups of your body can act as a coat of armor to help keep you safe. By learning how fall in a way that maximizes impact along these muscle groups, your contact with the ground becomes much less disastrous. In your lower body, we are mainly talking about using your glutes as padding. This means falling along a diagonal path that brings your impact onto one cheek at a time. Of course, this is really only beneficial if you can orient yourself so that your backside strikes the ground first. Luckily, your upper body is a bit better armored for impact. You have the large muscle wad of your forearm that can help dissipate force. Even your triceps and deltoids can be used to your advantage during fall. Similarly, the wide breadth of your lats (latissimus dorsi) can provide key protection to your trunk. What should you do if you don’t have that much muscular padding? Consider it one more reason to develop and stick to a strength training regimen. Aging naturally results in the loss of muscle mass over the years, thus you need to be extra diligent to maintain and build muscle as you get older. Lastly, there are certain times when rolling across the ground is the best solution to avoiding a fall-related injury. Over the years, I have fallen and rolled across concrete multiple times without getting hurt. It has happened when skating at the skatepark, training parkour, and even running my dog on a leash. Without the rolls, I’m convinced that either of the falls could have resulted in a trip to the hospital. Mind you, these were legit, hard falls on concrete with speed involved. Using a roll is so effective, that each time I popped up to my feet with a look of bewilderment: How I was I not hurt?! Note though, that the type of roll you do is of huge importance. We aren’t talking about an over-the-neck gymnastics roll. It’s closer to a martial artist’s shoulder roll, but with some slight tweaks. Parkour athletes have perfected this roll for the real world, since they regularly train without the pads or crash mats. It’s not within the scope of this piece to go into the details of a parkour roll here. Instead, please go meet with a local parkour coach to learn how. If you live in a major US city, the chances are high that there is a parkour gym awaiting your visit. The main thing is to know that rolling is a movement skill that everyone should to master. Maybe you will need it someday, maybe not. Either way, it is best to be prepared. Falling down IS a part of life. It’s time health care workers and the public health community recognize that not every fall can be prevented. As someone who wants to stay healthy and whole, make it your mission to learn how to fall without getting hurt. Furthermore, please help spread the knowledge to your loved ones, neighbors, and colleagues. If you want to learn more about the falling techniques used by parkour athletes, you are in luck. 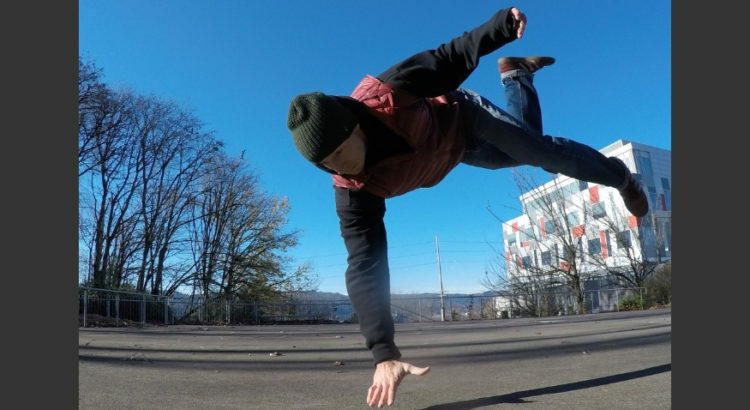 ParkourEDU recently released an online course titled the Art of Falling. This is the first time I have put an affiliate product on the website, and it is because this team puts out such high-caliber material. Amos, the course instructor, is a wonderful coach and a riot to watch. You should check it out. DISCLAIMER | word to the wise: Please don’t start throwing yourself on the ground willy-nilly because of this article. It’s not a substitute for one-on-one instruction. A good teacher will use appropriate padding and will make other adjustments to minimize your impact. Likewise, people with certain bone disorders, blood disorders, on certain meds, or with other health concerns should definitely talk with their doctor before beginning this type of training. Do you have a great story to share about falling down or injury prevention? Please leave a comment below. This is just the article I needed! Thanks so much for writing this; I got the link from the Institute of Clinical Excellence newsletter today! I am interested in starting a class on teaching people how to fall at a BJJ facility that I just started renting a room from for my cash PT/wellness/fitness practice. I have access to a HUGE mat that is slightly elevated off the ground to make it a bit softer. Great for learning rolling, break falls, etc. Nice! A BJJ facility with a crash mat would make the perfect learning environment. Good luck and let me know how it goes! Any recommendation for an inexpensive crash mat I can buy to leave out in the backyard for practicing falls at home? Or a smaller one for the bedroom — bigger and softer than a yoga mat? A folding tumbling pad that provides about 1.5-2″ of padding would cost around $120-150, whereas a true gymnastics-type crash mat with 8-12″ of padding could be multiples of that. A smaller scale solution could be a climbing/bouldering crash pad – they are more compact, but will cost $150-200. Neither of those options is something that I would want to leave out in the elements however. An old mattress could do the trick! Ben Musholt is a physical therapist and entrepreneur in Portland, Oregon. He co-authored Parkour Strength Training in 2016, and he published the Mad Skills Exercise Encyclopedia in 2013. When not coaching or helping his rehab clients move better, he can be found exploring the Pacific Northwest wonderland. His goal is to do 3 fun physical activities per day. Good luck keeping up. Back squat, ring rows, bar dips, and windmills. Oh my! All rights reserved. Ben Musholt Web Design and Development by Ovenlight.